(P1) If 2014 was the year of the selfie, then 2015 took the art of self-photography to a new and dangerous level. (P2) People are, quite LITERALLY, dying to take a picture of themselves. (P3) In Russia this year there have been several selfie-related FATALITIES, including the death of two men in the Ural Mountains who posed for a photo while pulling the pin from a HAND GRENADE. (P4) And, in June, a university graduate died after trying to take a selfie while hanging from a Moscow bridge. (P5) Most recently a 17-year-old boy fell to his death from a rooftop as he tried to take his picture for his Instagram page. (P6) He had previously taken a number of similar pictures of himself posing on high rooftops in the city of Vologda. (P7) The problem isn’t just limited to Russia. In the US recently a man died after shooting himself in the neck while taking a selfie. (P8) At least 12 people have died this year while taking pictures of themselves making the practice more deadly than shark attacks, of which there have only been eight recorded deaths in 2015. (P9) The statistic is creating very real problems for governments. (P10) In August, officials at the Waterton Canyon in Colorado were forced to close the park after several people were caught getting a little too close to the wildlife. (P11) “We’ve actually seen people using selfie sticks to try and get as close to the bears as possible, sometimes within 10 feet [3 metres],” said RECREATION manager Brandon Ransom. (P12) And, at Yellowstone National Park, officials issued a warning after five separate incidents of selfie-takers being GORED by bison. (P13) In Australia, a rock that looks like a wedding cake was fenced off because too many people were climbing it to take pre or post-wedding photos of themselves. (P14) While in Russia, in response to the number of deaths there, the Interior Ministry launched a CAMPAIGN warning that “self-photography could cost you your life”. (P15) “A selfie with a weapon kills,” the BROCHURE read. The accompanying poster campaign listed dangerous places to take a selfie. (P16) So why are some people willing to risk their life to take the ULTIMATE selfie? 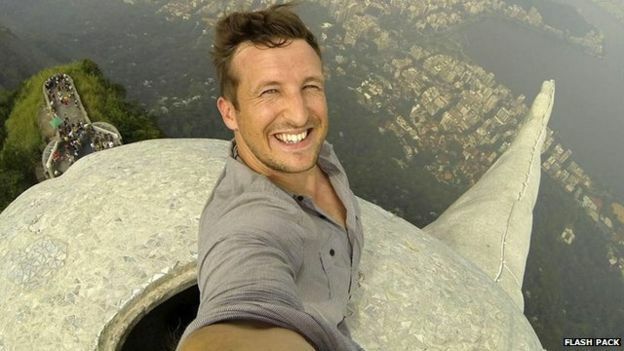 (P17) It may come down to pure BRAVADO, thinks Lee Thompson – whose snap of himself on top of the Christ the Redeemer statue in Rio de Janiero went viral in June 2014. (P18) “People see pictures like mine and see how they spread across the world and see a way to make themselves FAMOUS FOR 15 MINUTES,” he told the BBC. (P19) A professional photographer, Mr Thompson admits that the picture he took was done as a PUBLICITY STUNT for his travel company, Flash Pack. He did, however, get permission to climb the statue. (P20) “I’m not a SERIAL selfie-taker – this shot was to publicise my business. It was the shot I knew I had to get because people love selfies,” he told the BBC. (P21) He admits that the trend towards ever more dangerous selfies is “getting OUT OF CONTROL“. (P22) “Be creative with your pictures but don’t put yourself in danger,” he advised. Have you ever done anything crazy that you now regret? Are your friends enthusiastic about taking selfies, or not so much? Do you post pictures of yourself on Facebook? Is it possible to prevent people’s stupid behaviors, or will people continue to find ways to be stupid?